Picture the Dead is one of those books you see in a bookstore, pick up and thumb through, and then clutch to your chest as you move towards the cash wrap, as though someone might steal it from you. I had this book in an advance reader's edition, but I know that the hardcover edition will be beautiful and well worth a purchase. 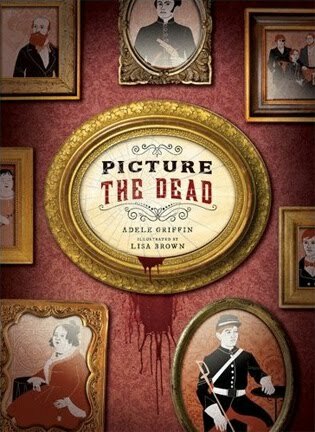 Adele Griffin (two-time finalist for the National Book Award) has written a wonderful story about a family of old money living in a dank, dark and empty home in Boston during the American Civil war. Jennie lives there at the mercy of her Uncle Pritchett and his wife. She is lonely- her twin brother Toby passed way in the war and she finds out very early in the book that her fiancee, her cousin Will, also died. The only Pritchett soldier to return home is Will's brother, Quinn. But Quinn was never warm, and now he is chased by ghosts and is full of secrets- some of them Will's. One day, when Jennie goes with her aunt, uncle and Quinn to get a family portrait done, she is briefly visited by Will's angry ghost. This sets her off on a course to learn what happened to her beloved fiancee in the war. I really, really enjoyed reading this book! I admit that a large part of that was for the illustrations. Lisa Brown, the illustrator, did a great job designing a Victorian-era scrapbook which aids Jennie in telling her story. In fact, readers know the climax of the book through the illustrations well before we hear of it in the written story. I think the illustrations were great here- scrapbooking was very popular during the Victorian era, and I think both the author and illustrator really captured the feel of the era through this method. This book has a very Gothic atmosphere, which complements the era. So many during the Civil War became interested in Spiritualism- making great attempts to contact family members lost in battle. I liked how Griffin brought that aspect into her story as well. Really, the Victorian era was as much a character in this book as Jennie was. Boston, with its snobbish, status-obsessed-but-money-poor families, was a perfect setting, and Pritchett House, with its imposing columns and fading grandeur, was also very evocative. I appreciated Griffin's ability to call attention to many aspects of the war that are often under-valued. The Civil War was the first major war to be documented through photography. Photography- as art and hobby- has a large role in this book. Griffin also touches on the ability of war to corrupt and change people who live through it. And on how the people left behind can become faded husks of their former selves- as they continue to age and grow, but their loved ones are not there to grow with them. She also talks about how often, men in war don't die in battle glory the way most letters home state they do. Sometimes, those letters are lies to appease family, but that doesn't make them wrong. (Note: This seems very common in military letters as it was also touched upon in The Things They Carried.) No one wants to imagine a corrupted family member. Or, even more so, one that suffered for days or weeks before passing away. These smaller details really made the story more real to me, and brought the Civil War era so much more to life. Of course, these details were aided by the great scrapbook illustrations provided. The whole package was just very well-put-together. I think this is an excellent book to read over a gloomy weekend. I loved the combination of story and photography, with a dash of Victoriana and a smidge of Gothic horror. Highly recommended! This review is based on an advance reader's edition. I received this book for free to review. I have this but haven't read it. I am dying to get on this one. Did you get "We Hear the Dead" as well? "a dash of Victoriana and a smidge of Gothic horror" - how awesome, I've never heard such description but reading your review it makes perfect sense and makes me want to read this book even though I do not necessarily like reading books set in or around the Civil War times. Oh boy, I need to check if the library has this one; sounds great. Thanks Aarti. Victorian era scrapbook illustrations? Sounds cooL! It's been a long time since I found one of those "clutch to your chest" books. Scrapbook? This sounds really interesting, maybe even one to clutch to my chest in the bookstore :) Great review, I really want this one now! 'Sometimes, those letters are lies to appease family, but that doesn't make them wrong.' That's an interesting position for the author to take, but I'm never sure I really agree with that point of view. It seems kind of wrong, even if it has happy effects. Like Amanda, I'm mostly not into war-type stories, but I do like illustrations. Or at least, I like it when authors try new things with narrative that incorporate words and illustrations (like The Invention of Hugo Cabret). I like it that people are doing this more and more these days, so I'm going to have to investigate this book when it comes out! I have never read a book that features a scrapbooking component, and as that is one of my favorite hobbies (aside from reading) this book definitely piques my interest. It sounds like it also has a really good story line as well. I love a good gothic novel as well. So many reasons for me to go out and grab this book! Great review, Aarti! I am so glad that this book was such a great read for you! Pam- No, I only got this one. But We Hear the Dead sounds great, too! Looking forward to seeing your thoughts. Blodeuedd- Yes, it's definitely different. Bookssnob- Probably not yet, but hopefully soon! lilly- Oh, really? I really enjoy reading about the Civil War era. brizmus- It's been a long time for me, too! But it's always based solely on covers for me, to be fair ;-) Or a highly-anticipated book. Amanda- REALLY? Hmm, I guess I assumed as you like classics, that there would be a lot of war in them, but there usually isn't. I don't think I LOVE war stories, but being a fan of epic fantasy, I really like reading about how war affects people. Jodie- I don't know if it's right or wrong but nearly ever book from war that I have read (this one, All Quiet on the Western Front, The Things They Carried) mention that it happens. I don't think it's wrong, really. No one wants to hear that a loved one suffered for hours or went through great indignity. Jenny- Yes, it's very inventive story-telling and like you, I really enjoy being here reading while people explore different methods. Zibilee- Yes, it was fun! I think you and your daughter would enjoy it. I love books on history through art or photography. This sounds like a wonderful read. I love your initial description of the bookstore scenario! I think of WWI, when everybody knew, eventually, how bad the trenches had been, and nobody could believe their family and friends had died gloriously there. I suppose the battlefield photography from the Civil War wasn't as widely available through reproduction. Pictures, ghosts, woman on a quest. Yes! I just realized it's by THAT Adele Griffin. Amandine is one of my favorite YA novels. I really must read this! Sounds very interesting! I've only read one or two fiction books set during the American Civil War, so definitely a period I could do to explore in future reading! Wow, great review Aarti! It intrigues me (a Civil War-era ghost story!) and I'm going to go put this book on my wishlist right now. This sounds super - and as though there is a really good sense of history which I do like in a novel. Lovely front cover as well. A pleasure to read your blog. This one sounds like it is right up my alley! Definitely going to be adding it to my list!! Thanks! Enjoyed the review! I must say that besides hearing about this lovely book...I loved the way you described a reader finding it on the shelf. That's definitely the case for many books that just steal the imagination from the moment they are first seen. I'm definitely going to look for this one. It seems like there are so many layers (visual, etc) in this story! Which section of a bookstore do you think it would be found in? Valerie, I think you can find it in the YA section when it comes out. I like the concept of the scrapbook. And the blood on the cover...for some reason I'm getting a kick out of the cover art. Really, I'm not morbid! Sounds interesting :) I'll look out for it. I haven't heard of this one, but I gotta say...being from the South, I haven't read too many books about the Civil War from a Northern perspective! I'll have to get my hands on this one. This looks great! Gloomy, dark, old money and gothic, I'm sold!